When you are logged in to Envaya, you can customize the appearance of the pages on your organization's site, such by uploading a logo or header image to display at the top of each page, and choosing a theme (background images and colors) for your website. From the Edit Site page ﻿, go to the Links section and click Edit website design, as shown in the image at right. Your organization's logo is a small image that appears next to your organization's name at the top of your Envaya site, and in many other places on Envaya. When you first register for Envaya, the organization's logo is a small map of the city where your organization is located. To change the logo, go to the Organization logo section of the Edit website design page, and click the button next to "New image" (it may say Browse, but it depends on your computer). Then, select the image file containing your logo from your computer. If Envaya is able to understand your organization's logo file, it will display a preview of the logo, as shown below. Click the blue Save changes button to update your website with the new logo. If there is an error processing your organization's logo, you can send your logo as an email attachment to admin@envaya.org , and we will add your logo to your website as soon as possible. By default, the top of your organization's website on Envaya shows your organization's logo, name, city, and has links that make it easy for anyone to share your page with other people by email, Facebook, or Twitter. The Website header section allows you to change what appears in this header. 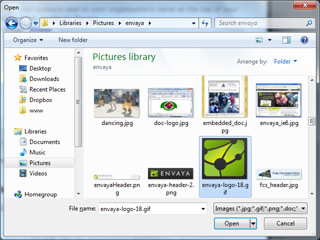 If you prefer, you can replace the entire header with your own image file by clicking Custom header image and selecting an image file from your computer. To change the background images and colors for your organization's website on Envaya, scroll down to the Website theme section. 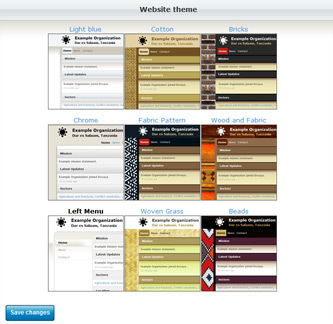 Click on the theme you would like to use, then click the blue button to update your website with the new theme.